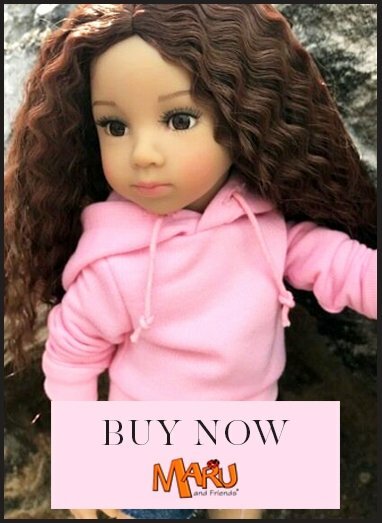 Vinyl play doll, 18”, 11 joints, fully posable, blue eyes, lashes. Nine pieces. Isabel is pretty in pink. She wears a short-sleeved printed tunic shirt with pink lace and pink capri pants with openwork decoration. Beneath she has on a white sleeve - less tank-top and underwear. Her sandals and polka-dot hair ribbons are a contrasting light blue. Isabel comes with a Kidz’n’Cats toy cat in a basket.